Free Welcome pack on amazing Holidays at Al Fresco Holidays. Don't miss out on this great offer to all the top destinations. Where do I use my Al Fresco Holidays voucher code? Find your perfect holiday by searching a destination, holiday dates, and party size. Once you have found your holiday click book and add any travel extras. You will be taken to your holiday summary page and this is where you can now enter your voucher code. On the left of the page, you will find some text saying 'Enter your voucher code' click this text and a drop down box will appear. Enter your code here and click 'Apply voucher code'. Your holiday total will be updated with any discounts you have received. "The more you holiday with Al Fresco the more you save off your holidays. Simply log in with the same account and if you have been on a holiday since 2015 a discount will be automatically applied to your holiday total, of up to £150!" With something to suit all taste and budgets, it’s no surprise that Al Fresco Holidays is a firm favourite with families across the globe. Make your next vacation more affordable but equally as luxurious with one of 7 types of Mobile Homes available where you can enjoy the comforts of home in a destination of your choice. Choose from a selection of popular destinations including Italy, France, Spain, Croatia and so many more with a plethora of activities on site suitable for all ages. Facilities vary from park to park, but you’ll find water parks, live entertainment, sports facilities, gyms, spas and much more as standard wherever you choose to visit. Some of the most popular Al Fresco Holiday locations include Sanguli, Duinrell, Les Prairies de la Mer, Le Brasilia, Bella Italia & Altomincio Family Park! 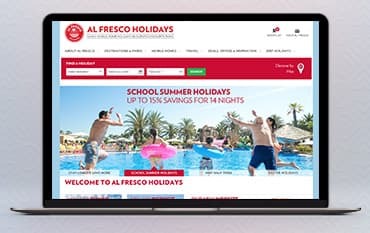 To keep the costs even lower using one of our Al Fresco Holidays Discount Codes which you can find on our deals page will help you save money off your next booking. What better way to enjoy your next family vacation than with knowing you’ve made a great saving. Al Fresco offers fantastic camping holidays in France where you can enjoy a fun, flexible family holiday with plenty of freedom and delicious cuisine. Holidays to France with Al Fresco are available in Brittany, Normandy, Vendee, Champagne, Loire Valley, Charente Maritime, Aquitaine, Languedoc/Roussillon and the Côte d’Azur. Al Fresco’s French holiday parks are set in stunning beach, lakeside and mountain locations that provide both excellent scenery and fantastic facilities. You’ll also find impeccable entertainment, tasty restaurants and a relaxed holiday atmosphere alongside laid back Al Fresco living. Off the beaten track of bustling Spanish resorts, you’ll find natural beauty and unspoilt interiors of Spain-the perfect setting for a Spanish camping Holiday. Enjoy a holiday along the rocky shoreline of the Mediterranean coast, with small coves and beautiful beaches. Just a day trip away from Al Fresco Spanish Holiday parks you’ll find Barcelona - the regions beating heart. Spain is oozing with culture, fiestas, feasts and festivals, all waiting for you to discover. Let loose wth dance and music in front of a stunning architectural backdrop and enjoy the true essence of freedom with an Al Fresco camping holiday to Spain. When is my holiday balance due? The remaining balance of your holiday total is due 10 weeks before your departure date. You can check in to your mobile home between 4-7pm. Check out is from 9am-10am. Can we pay in Euros? Al Fresco Holidays only accept payment in GB pounds sterling. Can we stay in tents? No, Al Fresco Holidays only provide accommodation in mobile homes. As part of the renowned TUI Family - one of the UK’s largest and most popular tourism providers, you can guarantee you’re in the best hands with Al Fresco Holidays. Boasting an abundance of luxury Mobile Home Holidays across some of the best parks in Europe, outdoor living has never been more stylish. Booking your next Al Fresco experience using an Al Fresco Holidays Voucher Code can secure you a great, money-saving deal on your next booking! From France to Italy, Spain & Croatia, find Caravan Parks like no others with Al Fresco Holidays. We are constantly on the hunt for Voucher Codes for Al Fresco Holidays to help you with your money saving. Our experts check dozens of sites for secret codes including NHS discounts, student sites & social media channels saving you time & money!